The Sunset Grille has a passion to serve and is proud to support the organizations in our community. 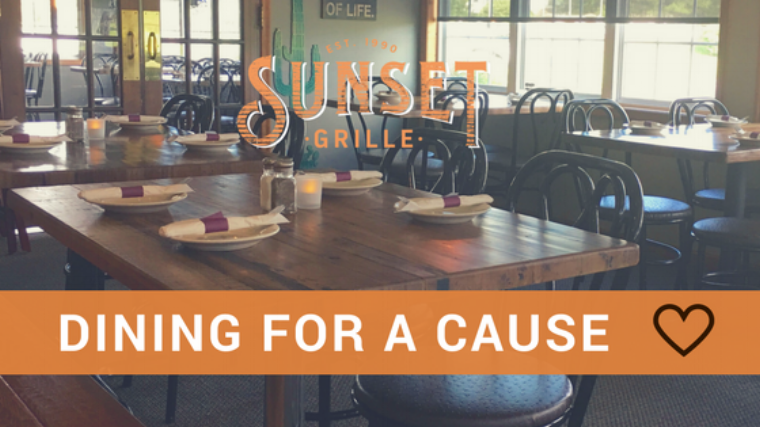 Apply to host a fundraiser at the Sunset Grille, Allentown PA and we'll donate 15% of sales (excluding alcohol sales, tax and gratuity) from your supporters back to your organization. Hosting a fundraiser at The Sunset Grille is easy! Step 1: Fill out a Dining for a Cause application and return it to the one of our managers. Step 2: Manager contacts you to confirm a date/time for your fundraiser. Step 3: Restaurant manager will provide you a customized flyer containing all details of your fundraiser. Step 4: Spread the word and market your fundraiser! Email and print copies of your flyers to distribute and email flyers to supporters, friends and family. Step 5: On the date of your event, your supporters dine at the Sunset Grille to enjoy our delicious food! Your supporters will present the voucher attached to the flyer to their server when seated. The Sunset Grille will then donate 15% of all sales (excluding alcohol sales, tax and gratuity) from your supporters back to your organization. A check will be sent to your organization within 30 days of your fundraiser. In order to have your check processed, you must fill-out an Organization Set-Up form prior to your event and provide a valid Tax ID#. We look forward to helping you raise money for your organization! Start planning your event today. It's as easy as 1,2.3. The links below are the forms you will need to get started. Just click and fill them out and email them back to us at info@sunset-grille.com. If you have any questions, give us a call at 610-395-9622 and ask to speak to one of our managers. 1. Read these important details to help you host a successful fundraiser! 2. Begin planning your event by fill out a Dining for a Cause application.